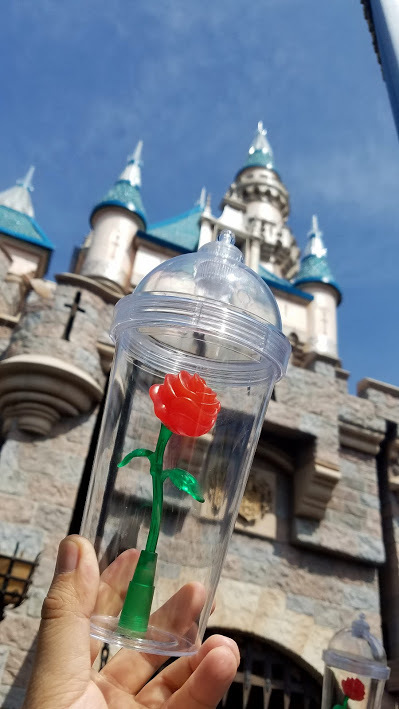 Giving away one of these beautiful Beauty and The Beast Rose Sippers from Disneyland! This giveaway is open worldwide and the winner will be notified by email! Good luck! Belle is my favorite Beauty and the Beast character because she sees people for who they really are. Oh my gosh, how long did you have to wait in line for it? I cannot believe the wait times to get it. Lumiere is my favorite because he just wants to make Belle feel welcome and even if he doesn't follow orders, he knows what is the best. My favorite Beauty and the Beast character is Chip because he's adorable and I love how he can remain optimistic despite his flaws! Belle is my favorite because I relate so much to her! I love to read and dream of far off lands, a lot of people think I'm strange because of it, and when I married my "beast", we lived in Quebec for a while, where I didn't speak the language well so all my friends were inanimate objects. Belle is hands down my favorite princess and I try to emulate her and her kindness in everything I do! Mrs. Potts is my favorite because she's wise, patient, and kind. Belle is not only my favorite beauty and the beast character but Disney as well. She was the first Disney princess that had the qualities of a 21st century heroine. She didn't dream about finding her prince or being a princess, she just wanted to live her life to the fullest and experience everything the world has to offer! I love belle so much because she is someone little girls can look up to for years to come. She is so unique and kind, and even though she is beautiful on the outside, she is even more beautiful on the inside. I relate to her so much, and I am so grateful I was able to grow up with a character like her in my life. This is tough. It's funny because my favorite princess is Ariel and my favorite Disney character is Alice but BATB has always held a special place in my heart. My favorite movie to sing along to. I guess my favorite character would have to be The Beast. He had so many walls up and was angry but knew when to let his guard down. He was very brave in more ways than one. I like Belle, she beautiful and kind. This cup is beautiful. Crossing​ fingers in hopes of winning. I did everything but the whole tweeter thing. I don't know how tweeter works. Haha! "I hope I win I hope I win". Got to keep saying this to myself. Haha! We are a huge disney family, Beauty and the Beast is my daughters altimeter favorite! I've loved this movie for many, many years. Very awesome of you to do a giveaway! My favorite character is Mrs Potts because she is a very kindly motherly type to Belle when she is without her own mother. My favourite character was Gaston. He made me smile during his scenes and he was a dastardly good villain!! This is Alice Wc, not sure why my name didn't appear. How do I pick just one? If I had to choose it would be Belle. She is kind, fearless and loves books! My favorite is Gaston, but my daughter loves Lumiere! Belle is my favorite character in Beauty and the Beast because she's adventurous, independent and very different from the rest of the classic Disney princesses. Belle and Chip are my favorite!!!! I love Beauty as yes she beautiful but she shows she is beautiful both inside and out and to be her own person and not follow the crowd. Belle is my favorite because she's smart & kind. She's so beautiful & I always wanted to be like her, I try hard to be. For me beast as cliché as that is, everything about him, his mood swings, his love for belle and the others, he's funny. My favorite character is Lumiere! He is so stinking cute! !Full of life, music and he brings the smiles to even the darkest of castles! Belle is my favorite character because she's so relatable and has such a kind heart. Belle is my favorite because she can see magic in all the book and she is not only my favorite because is the principal is because she care for all person, family, Friends and her town and she know how to see the beauty when nobody see it. Lumiere is my favorite character because he never lost hope in the true love that was presented before him! My favorite character is Chip because he's just so adorable! Belle is my favorite character because she is sweet and kind and she loves books and I am the same way. I also love how she cares for the beast and helps him and then falls in love with him even as a beast. She loves the person inside not what he looks like. That shows how really kind and amazing she is. I can not pick a favorite character. They are all amazing for their own reasons. And the cup is beautiful! Belle has always been my favorite character because I relate to her the most. I have always loved reading and was ridiculed for being different a lot growing up. Cogsworth is my favorite he's really smart and interesting to watch! This cup is so cute! Thanks for the contest! I like Belle because I'm a book worm too. Favourite character is definitely Belle. She's one of my all time favourites. I love her lust for more and her bravery. I see a lot in Belle that I try and carry into my own outlook on the world. Still dreaming of adventure in the great wide somewhere. Oh I hope I win! I stood in line for 2 whole hours at Disneyland and just my luck, they ran out just as I was almost to the front! Thank you so much for the contest! I like Mrs. Potts as she was voiced by one of my favorite actresses, Angela Lansbury. Belle is my favorite. I like her fashion style. I'm a fan of the Beast because he is such a sad and lonely fella and I like his tough outer shell with the big fuzzy inside! Wow, this is amazing! So perfect chance to win something so beautiful when in my country isnt disneyland. Thank you for doing this. My favorite Beauty and the beast character... was a tie between Gaston and Adam ( the beast) because Gaston showed no matter how good you looked and how popular you are nothing compares to intelligence and staying grounded. The beast showed no matter how you look on the outside, you can still be loveable and that beauty is truly found within. I love every character in the movie❗️I have to say Chip is tooooooo cute! My favorite Beauty and the Beast character(s) is between the Beast & Lefou. Although the story is centered in the love that Belle finds with the Beast, I think that these characters are really underrated especially when I found out that one of the directors (Howard Ashman) from the 1991 version had been suffering from AIDS. And just so slightly the movie changed for me, I began to appreciate something different about these characters and how the director might have connected them to him. My favorite Beauty and The Beast character is Cogsworth. He doesn't want to admit he likes to have fun, but he really has a big heart.